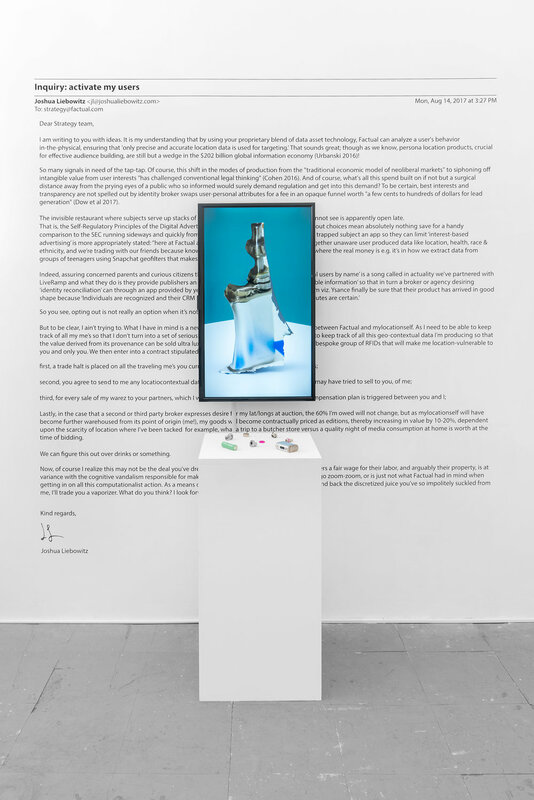 Joshua’s practice examines the relationship between technology and society, producing objects that combine virtual media and physical materials. His practice is built on an assertion that the underlying mechanisms driving public policy and cultural production can no longer be perceived – let alone analyzed, indexed or contributed to – without at the same time acknowledging the effects of increasingly digitized space, data and cognition as capital, and the alteration of Earth systems on individuals and communities. Liebowitz takes a tactical approach: viewing computation, new materials and digital fabrication processes not just as tools and mediums of aesthetic concern but as socially-bound forms unto themselves, he engages these procedures critically, developing objects that mediate the connections between the online and the physical. Joshua studied music and poetry at Columbia University, where he earned his BA in English. Last year he participated in solo exhibitions at CAFA International Gallery (Beijing) and Transmitter Gallery (NY), and has previously had group shows at Pioneer Works, Flux Factory, The Boiler|Pierogi, Associated Gallery, and St. Mark’s Church. His work has been discussed in The Atlantic, Huffington Post, ArtFCity, Packet BiWeekly, Jacket2 and Bedford+Bowery. He lives and works in New York City.